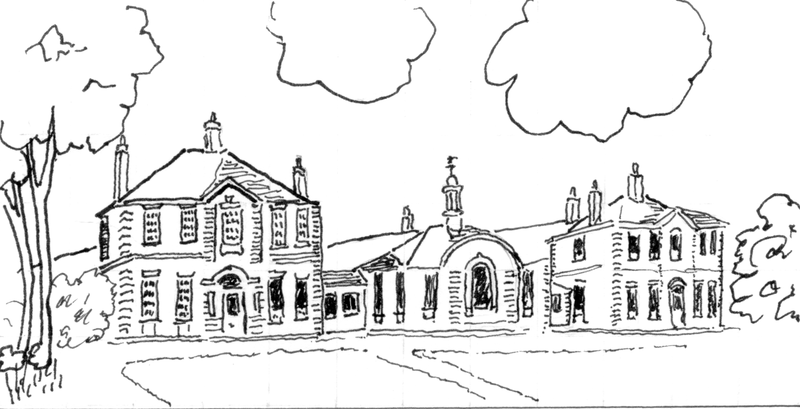 The Nelson Hospital in 1911: sketch, by Judith Goodman, based on the architect’s drawing. The centenary in 1905 of Nelson’s death at Trafalgar provided the occasion for much local pageantry, but also led to several more enduring projects to preserve his memory. A Cottage Hospital had opened in 1900 at 173 Merton Road, Wimbledon, but larger premises were soon required and the Nelson Hospital (see Bulletin 182) was opened in 1912, on land purchased from the Rutlish Charity at The Rush – now replaced by the Nelson Health Centre. Another memorial, Nelson Gardens Recreation Ground, lies within the former Merton Place estate, next to the church of St John the Divine, consecrated in 1914. 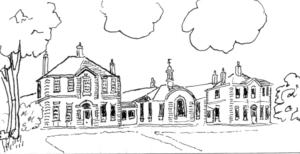 St John’s was just one of the new parishes which, along with churches and chapels of other denominations, were created to serve the new housing developments which sprang up around new railway stations – St Saviour in Raynes Park, Holy Cross in the west, St James towards Morden. A Methodist church was built in Martin Way, Baptist churches in Crown Lane and Kingston Road, and the Roman Catholic St John Fisher in Cannon Hill Lane. Motspur Park station opened in 1925 and Wimbledon Chase and South Merton in 1929. Meanwhile, the Underground line was extended to South Wimbledon and Morden in 1926, Morden Station in fact being on the Merton side of the parish boundary. The Wimbledon–West Croydon railway line that ran through the parish was replaced by the Croydon Tramlink in 2000. With these expanded transport links the fields to the south of Innes’ original development were soon being built on. From 1906 to 1935 Dorset Hall, 152 Kingston Road, was home to Rose Lamartine Yates, a leading suffragette. The John Innes Society has published a booklet Dorset Hall 1906-1935: a house, a family, a cause – Votes for Women! Another historic house, Long Lodge, became home to the Merton Park Film Studios, one of two sites in Merton for the early Film industry. Several large emplyers established themselves in Merton, including Carters Tested Seeds (1909), Bradbury Wilkinson, security printers (1919) and toy manufacturers Lines Bros (see Bulletins 163, 164 ) (1923), famous for the Triang range and Sindy (see Bulletin 199). All are now long gone, replaced respectively by housing, a hypermarket and a trading estate, and their departure changed the profile of local employment. Other, smaller, enterprises have come and gone, including British Rototherm (see Bulletin 190 ); and Young & Co (see Bulletins 153, 154 ). On a smaller scale was Palmer Reville & Co (see Bulletins 169, 170, 171 ), makers of midget racing cars at 14 Merton Park Parade, Jean Reville becoming a well known racing driver in the 1930s. Builder George C Wood (see Bulletin 199 ) was at 120 Kingston Road, while ironmongers Lampert (see Bulletin 164 ) were at the western end of the High Street before moving to Pincott Road. Hartshorn the butchers (see Bulletin 186 ) were in Coombe Lane. Merton’s pharmacies (see Bulletins 197, 202 )have also been the subject of research. Novelists Edna O Brien and her husband Ernest Gébler (see Bulletin 152 ) lived at 257 Cannon Hill Lane in the 1960s. Artists Harry Bush and his wife Noel Laura Nisbet (see Bulletins 137, 193 ) lived at 19 Queensland Avenue from 1914 until the 1950s, Bush being remembered locally for his paintings of nearby bombed houses. Merton suffered from bombing raids during the Blitz (see Bulletins 165, 166, 167, 168 ) and from V1 attacks (see Bulletins 177, 188 ).